Rip audio CDs and save tracks to any audio format! Backup your music collection into compressed AAC, MP3, WMA, or WAV format, or create a completely lossless FLAC library in just a few clicks. Magic Audio Converter and CD Ripper is an all-in-one audio backup solution. You can rip audio CD tracks or back up your entire CD collection while saving tunes into a wide range of audio formats. 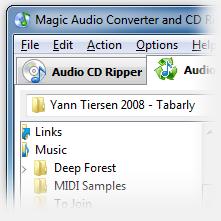 Whether you’re looking for the most universal (MP3), highest audio quality (AAC) or lossless (FLAC) format, Magic Audio Converter and CD Ripper will support it. If your portable media player requires a specific codec or audio format, the tool supports dozens of different file extensions and compression methods including the Apple Lossless Codec (ALAC) used in their latest iPod, iPhone and iPad devices for ultimate playback quality. 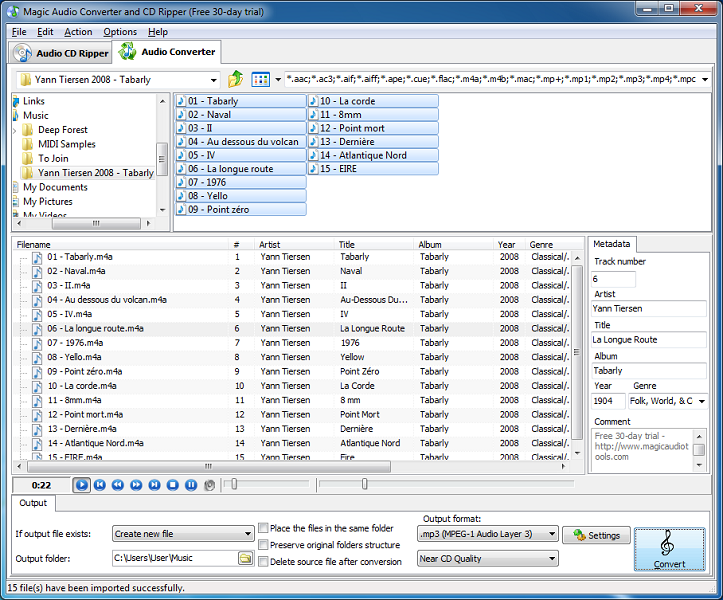 In addition to ripping audio CDs, Magic Audio Converter and CD Ripper can convert arbitrarily between all supported audio formats. 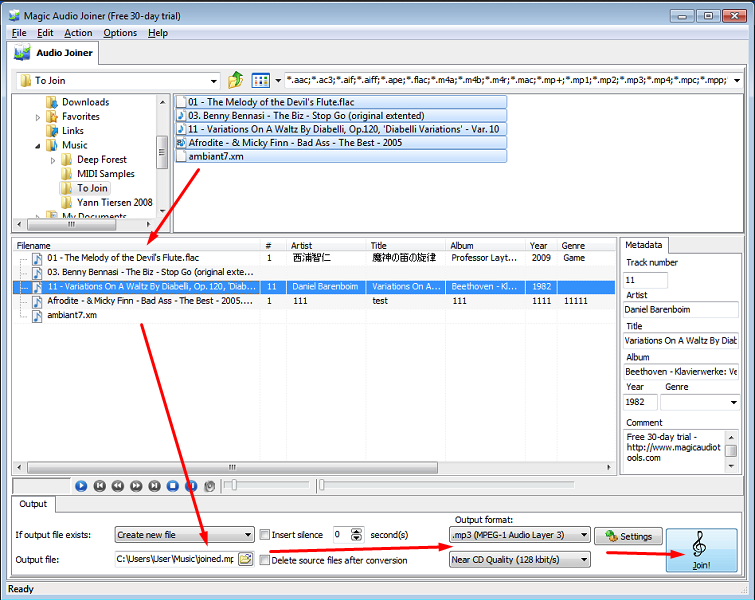 To rip a CD, just insert the disc, and the program will automatically obtain the artist, album and track information from the Free DB database. Converting the files is as simple as dragging and dropping. • Allows you to rip CD to aac, rip CD to m4a, rip CD to m4b, rip CD to alac, rip CD to mp2, rip CD to aiff, rip CD to m4r, rip CD to mp4, rip CD to wma, rip CD to wav, rip CD to ogg, rip CD to flac, rip CD to mpc, rip CD to ape, rip CD to mp3, convert flac to mp3, flac to wav, flac to aac, ape to flac, ape to mp3, ape to wav, mp2 to mp3, mp3 to m4b, mp4 to wma, wma to mp4, wv to wav, wv to mp3. Play MIDI files in your iPod! Convert your MIDI files into high-quality AC3, MP3, FLAC or other formats while choosing your favorite sound font and adding reverb/chorus effects to your liking. 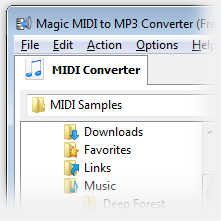 Magic MIDI to MP3 Converter helps you play your favorite MIDI tunes anywhere. Convert midi files, piano midi and backing tracks into a standard file, or use classic MIDI ringtones in today’s communicators and too-smart phones. Supporting a wide range or input and output audio formats, Magic MIDI to MP3 Converter lets you convert MIDI files into AC3, MP3, WAV, APE, FLAC, or OGG formats. Magic MIDI to MP3 Converter recognizes all types of polyphonic MIDI, MID, RMI and KAR formats, and supports custom sound fonts and adjustable reverb and chorus effects. The built-in tag editor allows adding audio tags such as artist, title and album information. 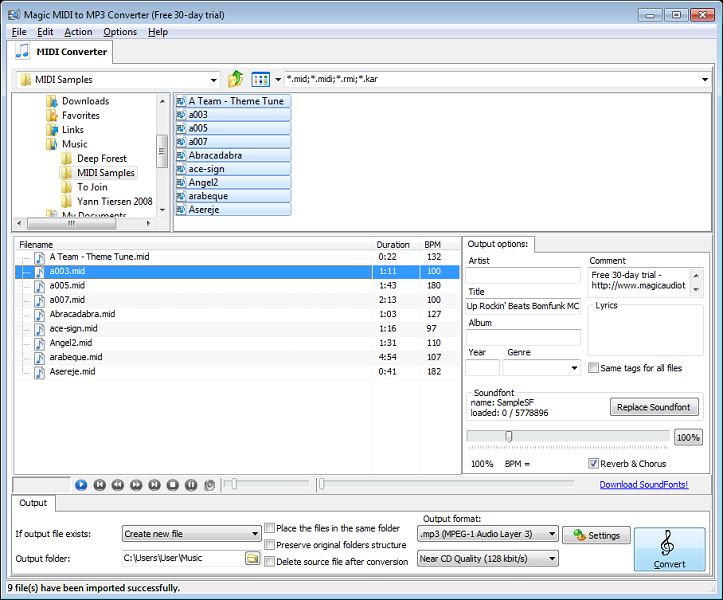 If using a compressed audio format, you can always select the desired compression rate. • Allows you to convert midi to mp3, midi to wav, midi to aac, midi to m4a, midi to m4b, midi to mp2, midi to aiff, midi to m4r, midi to mp4, midi to wma, midi to ogg, midi to flac, midi to mpc, midi to ape, kar to mp3, kar to wav, kar to aac, kar to m4a, kar to m4b, kar to mp2, kar to aiff, kar to m4r, kar to mp4, kar to wma, kar to ogg, kar to flac, kar to mpc, kar to ape. Join individual audio tracks into a single file! Customizable pauses with gapless playback option let you produce a perfect mix. Magic Audio Joiner concatenates any combination of WMA, MP3, AC3 and a dozen other audio formats into a single file. Pick a bunch of files in random formats and create a long single track! 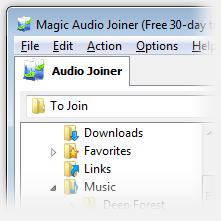 Supporting over a dozen popular audio formats, Magic Audio Joiner can accept and produce files in any audio format. With its simple drag-and-drop interface, all you do is just dragging music files you want to merge, optionally adding track, artist, title, and album information. Add pauses between tracks or drop them to create a gapless mix! • Mp3 joiner, wav joiner, wma joiner, ogg joiner, ac3 joiner, aac joiner, aiff joiner, ape joiner, flac joiner, m4a joiner, m4b joiner, m4r joiner, mp1 joiner, mp2 joiner, mp4 joiner, mpc joiner, spx joiner, tta joiner, wv joiner, 3gp joiner, 3g2 joiner in one. Burn Audio CDs for free! 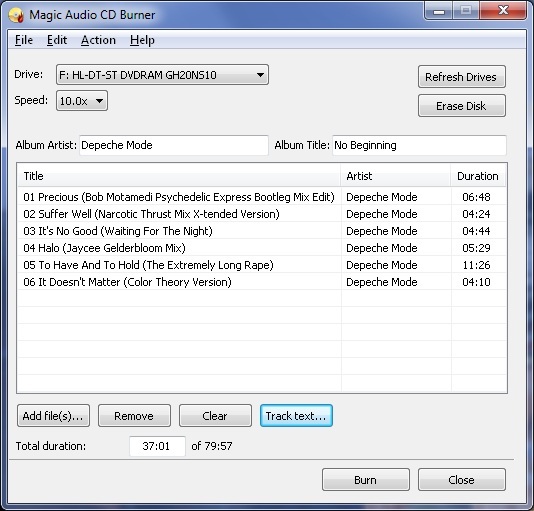 Magic Audio CD Burner burns your audio files onto an Audio CD for absolutely free. Burn your music collection to play it back in a car, CD changers or portable CD players without paying a dime! You can burn any combination of MP3, AAC, FLAC, 3GP and many other types of files by simply dragging and dropping. • Allows you to: burn aac to CDa, burn ac3 to CDa, burn aiff to CDa, burn ape to CDa, burn flac to CDa, burn m4a to CDa, burn m4b to CDa, burn m4r to CDa, burn mac to CDa, burn mp+ to CDa, burn mp1 to CDa, burn mp2 to CDa, burn mp3 to CDa, burn mp4 to CDa, burn mpc to CDa, burn mpp to CDa, burn ofr to CDa, burn ofs to CDa, burn ogg to CDa, burn spx to CDa, burn tta to CDa, burn wav to CDa, burn wma to CDa, burn wv to CDa, burn 3gp to CDa, burn 3g2 to CDa. Merge a bunch of audio clips into a single track! Multiple audio formats and customizable pauses with gapless playback option let you produce a perfect mix. • Mp3 merger, wav merger, wma merger, ogg merger, ac3 merger, aac merger, aiff merger, ape merger, flac merger, m4a merger, m4b merger, m4r merger, mp1 merger, mp2 merger, mp4 merger, mpc merger, spx merger, tta merger, wv merger, 3gp merger, 3g2 merger in one. Free M4A to MP3 Converter is our free wav to mp3 converter tool that you can try, in order to see what our products are like. 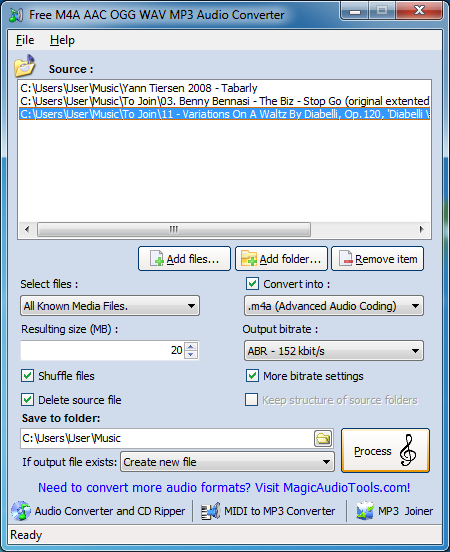 Free M4A to MP3 Audio Converter is a free tool to convert between a limited range of audio formats. The converter accepts any combination of AAC, M4A, OGG and WAV formats as an input, producing AAC, M4A, MP3 or WAV files in the output. Its drag-and-drop interface makes the conversion quick and simple. You can shuffle the files or keep the original folder structure, and specify your desired bitrate and sound quality. To convert between many more audio formats, you’re welcome to try our feature-packed products. 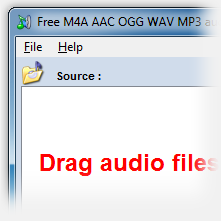 • Allows you to convert m4a to mp3,aac to m4a,aac to mp3,aac to wav,m4a to aac,m4a to wav,ogg to aac,ogg to mp3,ogg to wav,ogg to m4a,wav to aac,wav to m4a,wav to mp3.